A few nights ago at 11pm I had a sudden urge that I had to listen to the CD recording from the only reading I’ve had from a medium since my mom passed. It’s been over a year since I have heard the chilling and comforting messages my mom brought from the other side. Before I start into that, let’s rewind a bit shall we? After my mom passed away in early 2009, my heart ached. It still does. It was unexpected when it happened so along with the shock there was a lot of grieving. As my and my sisters continued to have more babies, get married and all of us make more life changes there was also so many times a tangible feeling of deep loss at those events, not being able to see my mom there with us. We’ve each felt her around at different times, we’ve all gotten signs, had dreams. But there is nothing like the direct hug, conversation or looking into her beautiful loving eyes. I’ve always been skeptical of people who say they can communicate with spirit. I still am actually. But I’ve know too many times where I know it to be true that I don’t doubt it’s possible. I know in fact that my mother has came to me in dreams, I’ve been given answers to deep questions I’ve prayed about. 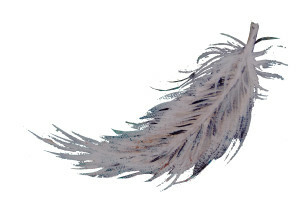 I pray, ask for help my angels, talk to my spirit guide and talk to my mom often as if she’s hear with me. Back to the CD, in listening to this call the medium (Dwanna Paul) talked about things very clearly that had just happened that day. She talked about what my husband had just said to me right before the call, passed along my mom’s motherly guidance based on what my sister and I had talked about the night before. When I asked about messages for my brothers or dad the next 3 things she talked about in a row were for 1 brother, then something exactly regarding my younger brother, then my dad. It was unbelievable. I loved too that during the call there were a couple things I didn’t understand. One for instance was she said my mom was showing her a strand of pearls. That didn’t mean much to me during the call. So she told me to just keep it in mind and I’ll know what it’s supposed to mean. 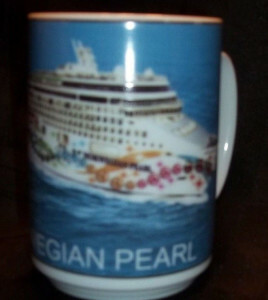 The next morning I was sitting having coffee and I looked down and my mug and gasped… the mug was from my honeymoon cruise. 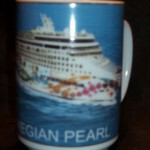 The cruise I was ready to board when I found out my mom had passed away; the Norwegian Pearl. Along the side of the ship was a strand of pearls. The same ship that we re-took our cancelled honeymoon on 10 months later. The same ship that randomly at 3am I went out to our balcony of sobbled, deep cathartic cries of missing my mom and talking with her about my life. My missing her, but being really happy otherwise. Talking to her about all the random things I would have when she was alive. Then I remembered that right before the call the night before with Dwanna, I asked my mom to bring up that conversation as a sign. Wow. She sure did. “Yes, I understand that every life must end, aw-huh,.. The last line of the song is, “meet you on the other side”. I just sat and cried. Then I got home and googled it. I studied the words and listened to it a million times. It was so healing. Then I really payed attention to who it was by… Pearl Jam… yep another pearl reference.. mom, you are amazing!!!! Looking back the song was released the year she passed away, yet I never was aware of it until all the above happened in 2011. Really cool. I recently read a comment from a friend that she had shared on another’s page. She was talking about the frustration she was having because her mom is in a dark place, not able to see her light, her gifts. She’s depressed, hoarding and near death. It’s SO heartbreaking when we want to help someone and they won’t accept our help. I’ve dealt enough with people with addictions and depression also to know this to be true. Its the deepest kind of frustrating, and especially when the person passes on it leaves us with a pile of what ifs. What if I could have spoke up more, earlier. What if I was too rough. What if I wouldn’t have judged but instead would have just loved? What if I wouldn’t have just loved them but instead would have helped them get help…. it is a loop of unrest, and questions that can’t always be answered. I’ve settled on a deep comfort of believing that no one passes before their time. We all have a time that we’ve planned out before we even got here in this body. It’s all divinely perfect. From a human level we often don’t get it, but from a spiritual and soulful level, it’s perfect. There is a peacefulness that can come from this. It’s allowed me to go from anger to gratitude and surrender. When we’ve lost someone we love, our biggest shift can come when we stop focusing so much on their passing and instead start to focus on the gratitude for their time in our lives. Our experiences shared, lessons taught and learned. The love we gave and received. When we can pull ourselves from the anger of not having longer and instead sit in gratitude for having what we did. Today I sit in gratitude for those who are in my life. I savor the memories of those who have passed. I work to live my life in a way that others will someday look back at their times with me and feel love.